@crackerjack82: The difference is that Iron Fist can only move that fast for a short burst. Adam Jensen can run at that speed all day. In the interests of appeasing the 'illusions are scary' crowd I am subbing out Gypsy for Temugin. My team will now be Deathstroke, Daken, Bullseye, Temugin, Adam Jensen. Stuff. 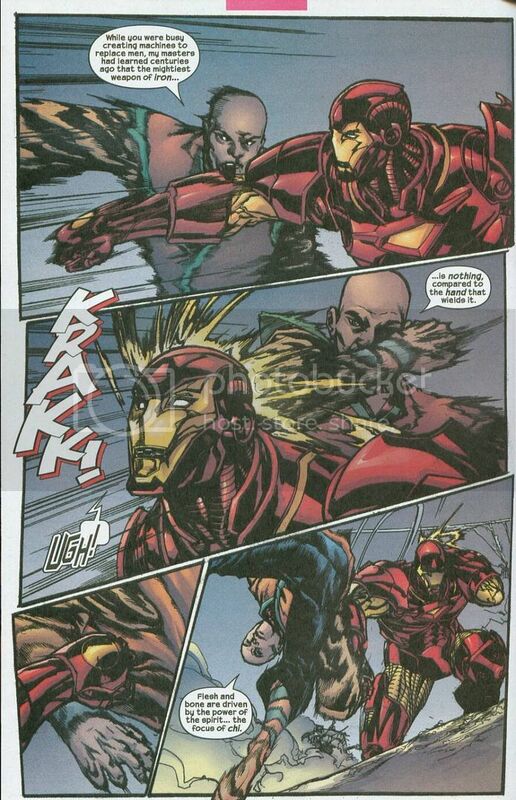 Here is a fight with Temugin vs Iron Man to give you a bit of flavor. He can manipulate Chi to enhance his durability, speed, strength, force of his blows, etc. He has very high tier fighting skills, easily the match of Danny Rand or Shang Chi and he can use Chi to see the flaws or weaknesses in something like Karnak. Please seem impressed or something. My new team will be Cable, Toph, Iron Fist, Blink, and Sage. Iron Fist can't "run" at that speed, but we haven't seen a time limit for him moving at that speed. So in a foot race, it is easy to say that Adam Jensen would destroy him. As for a fight, I haven't seen anything to indicate that Iron Fist can't keep up with and react to his speed, as he has been able to do so against characters like Spider-man. 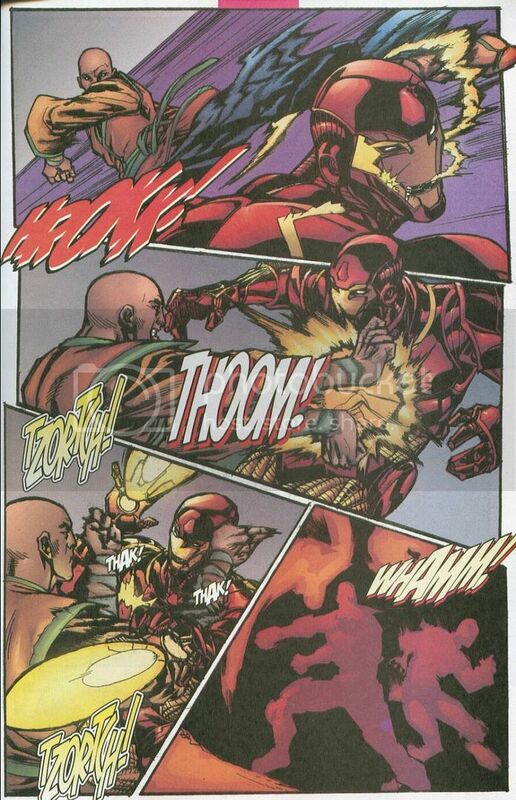 I can also post scans of classic Iron Fist bullet timing, and since his chi abilities have become much more powerful since then it is safe to say that the extent to which he can amp his abilities has too. If you have anything showing Adam Jensen's combat speed I would love to see it. @Ferro Vida: Well that's the thing about a 6 part mini-series of comics. He sort of never engaged in a foot race. But, his cybernetic limbs never get tired. The muscles are artificial and don't produce fatigue toxins. He can just run all day by virtue of that alone. Also, Spider-Man isn't a bad gauge but he's also not a great one. I mean he never has good showings against heroes because he never goes all out on them. Shang Chi, Daredevil, Captain America etc have all tagged Spider-Man and they're all drastically slower. He just doesn't go all out on them, ever. I think the only good showing is Bullseye because Spider-Man actually does try to avoid lethal projectiles from psychotic killers, he had his game face on but he still got punked. @Dane: IIRC the third time they fought (in the 90s) Spidey was trying to bring IF down. Danny had been framed for murder, and had heroes coming at him all whilly nilly. He actually had a better showing against Spidey there then he did in their first encounter. @Ferro Vida: Oh, I agree Iron Fist could or should do well against Spider-Man. But Spidey never comes at someone the same way Deathstroke for example comes at someone. He doesn't have that killer instinct to take someone down. Iron Fist might not be on the Slade Wilson end of the nasty business scale but he has it in him to lay the complete smackdown on someone regardless of whether they're a hero or not. Peter Parker very much does not. I'll be honest here, I think Bullseye is going to fire a volley of Adamantium, Explosive and EMP arrows and you will lose most of your team. I think Deathstroke, Temugin and Daken are going to finish the rest. Jensen is really just there for extra firepower/invisible facerolling. And let's not forget he has a silenced Sniper Rifle he can fire while invisible. Kinda nutty. I think the only one on your team who isn't going to get one-shot is Iron Fist. He is the only one with a reaction speed fast enough to avoid ricocheting arrows and high caliber bullets. He is the only one with the means to either dodge or deflect those projectiles and he's probably going to be the only one standing after the initial attack. Even objectively I would argue IF vs Slade - I think it'd be a tight match. But IF vs Slade, Daken, Bullseye, Temujin? No way. ooh yeah regarding the Gypsy's illusion skill during the Blackest Night run her powers didn't do much good. Anyone care to clarify, please? I already had to remove her because people were sad. But at the same time, pretty much nothing worked against the Black Lanterns except plot devices. But it's probably also because they didn't have living brains to affect. They were essentially just corpses being controlled. Peter has shown that he will not hold back his powers even without the killer instinct. For example, in Secret Wars he trashed the X-men (including Wolverine and Nightcrawler, who have kept up with him in the past) without killing anyone. When he puts his mind to it he can be pretty much untouchable. When he fought IF he was there to accomplish a goal. He wasn't goofing around. Iron Fist was still able to touch him. We start from 100 feet away. That gives my team more then enough time to react to an attack. Their minds are linked by Sage through telepathy. Her mutant ability to process information like a computer will let her know what is happening faster then any human being could, and take into account what her teammates know (information from Toph's Earthbending, Cable's eye, and IF's heightened awareness). From there she can feed the information to each other member of the team faster then they might normally be able to get it. Blink is more than capable of moving the entire team if necessary, and she has shown that she can use her teleportation strategically to defeat a dangerous foe (briefly defeated Holocaust in AoA on her own). We are still in a big stone building. Toph can manipulate stone however she wishes. I'm still digging through AMVs on youtube to show some of her feats, but she perfectly capable of instantly putting a barrier around my team, creating a rock wall to smash through yours, opening up a pit beneath your feet, or just causing your team to sink into the floor. I'm sure guys like Deathstroke and Jensen are fast enough to avoid some of this, but I'm not so certain about Bullseye. Even if it doesn't incapacitate any of your team, it knocks you off balance and scatters you. Cable still has his gravimetric sheath here, as we discussed before. At that distance Bullseye's arrows won't be a problem. By working together I'm pretty confident my team can beat yours. Iron Fist can conceivably take any of your team in a straight fight, and I have an edge in overall defense and mobility. Not to mention Cable's combat experience AND Sage's processing power. And if we were fighting anywhere else then I would tip my hat to you, because you would very likely destroy me. But we are fighting in a big stone building and I have the most versatile Earthbender in Avatar on my team. Iron Fist was still able to touch him. We start from 100 feet away. That gives my team more then enough time to react to an attack. Eh, I don't know about that. 100 ft is really nothing for Bullseye. I mean, giving Bullseye a Bow and a Quiver of Trick Arrows is just nutty. But I did it. He's got Adamantium Arrows in there, what are you possibly going to use to block them? Her mutant ability to process information like a computer will let her know what is happening faster then any human being could, and take into account what her teammates know (information from Toph's Earthbending, Cable's eye, and IF's heightened awareness). From there she can feed the information to each other member of the team faster then they might normally be able to get it. Well the problem I have here is your ability to reaction to something is not a function of your brain speed, not wholly. You can only process the information your senses give you. Her senses are human, her reaction speed is human. Ditto Toph. Now Cable may have slightly enhanced reaction speed but what is he going to do? Stand in front of an EMP arrow? Bad idea. Iron Fist might catch an arrow or two but seriously. Bullseye has exploding arrows, he's a nutbag, he's going to use them. How many exploding arrows can Iron Fist catch or narrowly deflect without taking serious damage? Not a lot is my guess. Just for reference: Spider-Man is the limitation on all physical attributes. This includes reaction speed and reflexes. If Bullseye can tag Spider-Man then he can tag anyone in this scenario by default. Again, I find this to be a question of reaction speed. Blink's reflexes are human speed unless I am mistaken. And here is the scary thing: If Blink opens a portal and her team goes through it - won't the arrows and bullets also go through the portal and follow them through to the other side? Even if she opens the portal on the floor, Bullseye is easily good enough to ricochet his projectiles off the ceiling and put them through the portal. Yeah, he just blew up a car by throwing a hubcap into it's fuel tank. No biggie. We are still in a big stone building. Toph can manipulate stone however she wishes. Possibly useful. However, I have three problems with it. 1) I have dodge feats for my whole team that would suggest they can dodge most of her techniques or at least have the common sense to jump out a window instead of being crushed under tons of rubble. 2) Does she really have the cajones to kill 5 people by crushing them to death to begin with? 3) She would probably die before she had a chance to channel her powers in such a way. An EMP arrow or grenade will knock that right out. Deathstroke is far too tactically intelligent to have the exact tools at his disposal that would counter your force field and not use them. Not to mention the rest of my team are extremely skilled and intelligent on their own. 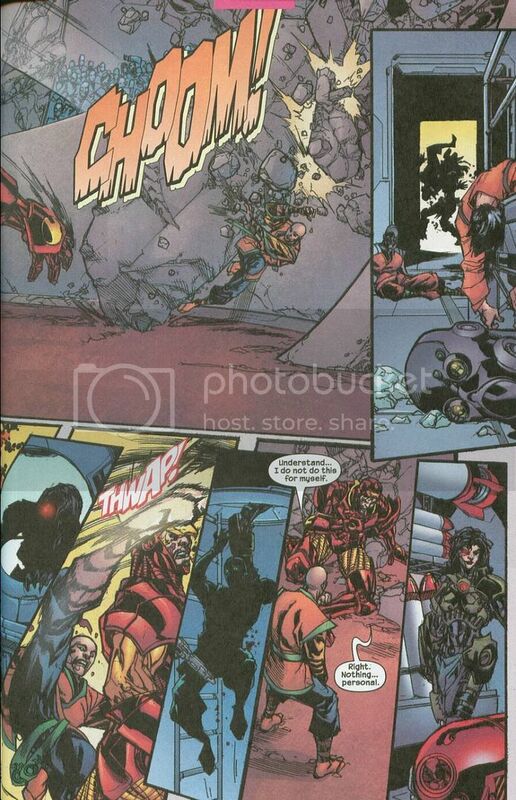 But tactically, no one on your team can match Slade for tactical acumen or even more dangerous; the speed at which he can formulate extremely complex and considered battle plans. He makes Batman look like a kid playing checkers, it's ludicrous. By working together I'm pretty confident my team can beat yours. Iron Fist can conceivably take any of your team in a straight fight, and I have an edge in overall defense and mobility. Not to mention Cable's combat experience AND Sage's processing power. Iron Fist is definitely your best straight up fighter. But he wouldn't beat Temugin. Temugin can do anything and everything Danny can do and then some. 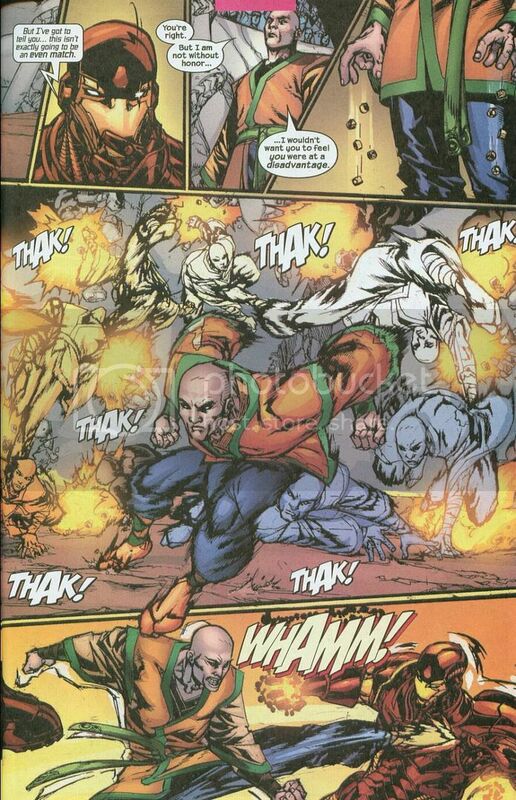 The Karnak-style weakness detection combined with Deathstroke's tactical ability alone are deadly. The fact that this guy beat down Iron Man and hurt The Hulk with nerve/pressure points strikes? (scans upon request, sir) That's a nasty combo. His Chi-enhanced strikes are at the very least as good as Danny's. I'd honestly say they're better judging from the scans. I would also question how well Danny would do against Slade or Daken. I think he would beat Daken but that would be a very, very long match. Daken has taken hits from Skaar, Hulk and even Thor and still stood on his feet. Helicarrier wrecking strikes are impressive, but Daken could tank them. The problem is: all anyone on my team has to do is occupy Iron Fist and at least 3 of them can undeniably do that. While he is engaged in a fight, the rest of your team is radically outclassed. If you had 3 Iron Fist-level fighters it might be a difficult fight, but there is only one of him. Ignoring the physics-boggling nature of that toothpick feat, people have dodged Bullseye before. Not just Daredevil. Elektra has done it, thanks to her time training. And it doesn't matter how accurate a shot he is with that bow and arrow, because those arrows still move at a certain speed no matter who is firing them, they still take time to notch into a bow, and they CAN be avoided. Iron Fist has done it, Toph has avoided arrows, Blink, Cable, and Sage have all dodged bullets... Yes, Bullseye is a dangerous shot, and his trick arrows are a threat. But during his time as Hawkeye I only recall him using his trick arrows when he was toying with Elektra. Sure, Slade could tell him to use them, but that takes time. Your guys need to talk to each other to relay any kind of plan, and there's still no guarantee that they will all work together. Daken and Bullseye have come to blows more than once, and for however charismatic Slade is there is not telling for certain whether or not Daken would be taken in. I'd say that her abilities put her on par with Deathstroke in terms of formulating a strategy. It would take her senses the usual amount of time to process information, but once that information has reached her brain she can react faster then any human being can. At a glance she can realize the most likely course of action for your team to take based on their equipment and what she may know about them. And her telepathy lets her relay that to the others. Toph's reaction time would be faster then a normal person. She is essentially Daredevil with control of dirt and stone, and in the show she has reacted to attacks as if they were moving in slow motion. Cable also has enhanced reaction speed, as you said, and his gravimetric sheath can take most of what Bullseye might throw at him. Except for the EMP arrow, but I still question him using that right out of the gate. And my team can just have Toph raise a ten-foot stone wall out of the floor. A couple exploding arrows would get through it, but it would give my team more of a chance to react, and stop any projectiles from following them into Blink's portal. Also, Bullseye wouldn't only ricochet an arrow into the portal if he knew the angle he needed to fire at to begin with. 1) I didn't say they would be crushed, I said they would be scattered. Them dodging would do just that. Also, are you allowed to leave the church? 2) Toph isn't really squeamish about killing. I'd say she would. 3) See my earth- manipulating Daredevil response above. I'd argue that Sage can. Danny is a guy who punched out Hercules, Luke Cage, Thing, Skaar, and has dropped the Wrecking Crew single-handedly. He's killed giant dragons with his bare hands like they were nothing. If you have scans of Temugin in action then I'd like to see them, but I would still give Danny an edge in combat against him. I won't argue that Danny can beat all your guys at once. He can't. Which is why I don't plan on having it come to a straight up fight. If you'd like I'll move on to a new strategy to counter yours. Also, if it's not too much trouble, I'd like to state that the equipment for Sage will be her sunglasses and a silenced M16 with a scope and adamantium bullets (I know they are being used in other threads, so I don't see it being an issue). @Ferro Vida: Um, sorry, I didn't realize you had the Agamotto Empowered Iron Fist here. Let me go swap out Deathstroke for Doctor Strange. But seriously the limit on strength is Spider-Man so even if he could strike with force greater than 10 tons, none of those showings would be valid in the tournament. And I will respond to the other points tomorrow because nap time. @Ferro Vida: Um, sorry, I didn't realize you had the Agamotto Empowered Iron Fist here. Let me go swap out Deathstroke for Doctor Strange. But seriously the limit on strength is Spider-Man so even if he could strike with force greater than 10 tons, none of those showings would be valid in the tournament. I don't, I just posted that because it was funny. Also, pre-Agamotto IF would be able to strike with that kind of force anyway. 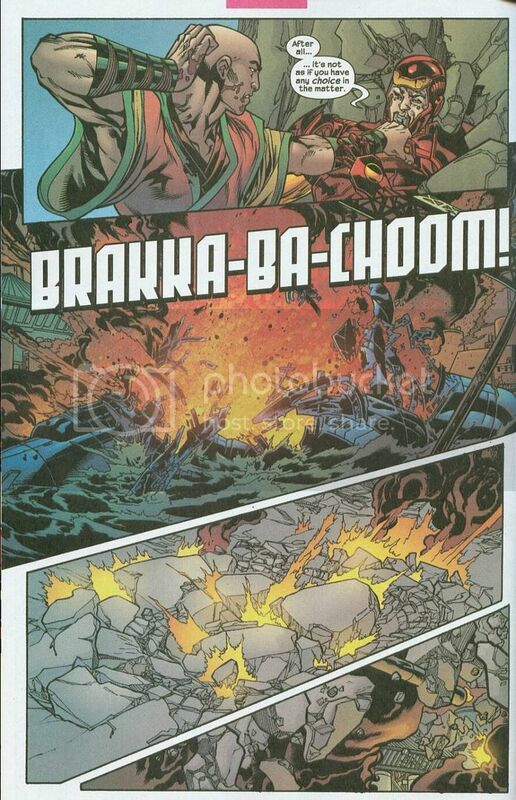 Skaar doesn't weight more then the Helicarrier does, and Danny was able to disrupt it's flight path upon impact. I can't say whether or not Skaar would be knocked out from the force, but he could be sent flying like that. And Danny's strikes with the IF are technically due to energy manipulation, not superhuman strength. As expected, nice debate so far. Good to see you active a gain Ferro. @beatboks1: Good to be active again. I had forgotten how much I actually missed all of this. "Ignoring the physics-boggling nature of that toothpick feat, people have dodged Bullseye before. Not just Daredevil. Elektra has done it, thanks to her time training. And it doesn't matter how accurate a shot he is with that bow and arrow, because those arrows still move at a certain speed no matter who is firing them, they still take time to notch into a bow, and they CAN be avoided. Iron Fist has done it, Toph has avoided arrows, Blink, Cable, and Sage have all dodged bullets... Yes, Bullseye is a dangerous shot, and his trick arrows are a threat. But during his time as Hawkeye I only recall him using his trick arrows when he was toying with Elektra. Sure, Slade could tell him to use them, but that takes time. Your guys need to talk to each other to relay any kind of plan, and there's still no guarantee that they will all work together. Daken and Bullseye have come to blows more than once, and for however charismatic Slade is there is not telling for certain whether or not Daken would be taken in." Daredevil and Elektra have better reactions than anyone on your team save Iron Fist. Which is all I ever claimed. I know for a fact Elektra begins to dodge before a projectile has been thrown or before a gun has been fired. I have to scans to prove it but basically she reads the person's muscles and movements to predict when they will fire and she moves before the projectile is even launched, so she appears to dodge with ease. Most street levelers, i.e. people without enhanced reflexes do this. Dodging bullets and dodging Bullseye aren't the same thing though. Many characters who regularly dodge bullets with ease like Spider-Man cannot dodge Bullseye's projectiles. He's just really good at aiming and if you think about it he can very easily fire reactionary projectiles. Say he fires an arrow at someone and they dodge be either diving to the side or jumping in the air. In the time it takes them to move from where they were standing to where they want to be to dodge something he could have fired an arrow toward where they will be. So they dodge one projectile and get hit by another. Bullseye has even tagged Daredevil numerous times by doing this. I have scans of Bullseye using explosive arrows. I asked specifically if I would have all of Hawkeye's trick arrows for scenario and I was told yes. 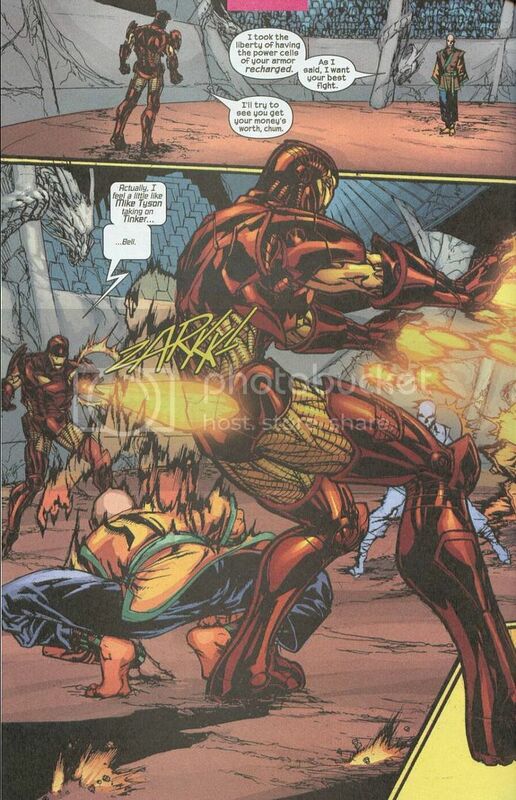 So he does have exploding arrows, emp, gas, glue, pym particles, adamantium, the whole works. He might toy with Elektra but he has no qualms about obliterating standing targets. He doesn't need Slade to tell him to use an EMP arrow against a technology-based force field. He is not a moron. Slade has coaxed loyalty out of people who hate him. I don't think he will have any problem commanding it from people who are vaguely indifferent. All he would have to promise Bullseye a bundle of cash. Daken will do it because Cable is a long standing rival of Wolverine's (plenty of scans to prove it). He has shown with Cyber that he wants more than anything to succeed where his father has failed and prove that he is better. He would try to take down Cable's squad just for smug satisfaction alone. I'll need scans to prove Sage's tactical abilities. I respect they are likely substantial, but Slade is the diamond standard in batshit plan preparation. I will also need reaction feats from Toph. Keep in mind she knows nothing about Bullseye or his equipment. Daredevil always has the advantage of knowing how Bullseye operates. Let's not go overboard with Cable's reaction time. People like Deadpool can tag him with ease, he isn't that fast. He has been shot multiple times by cannon fodder because he could react. But he is a touch above a regular human because of his cybernetics. Again, what is faster in all honesty: The explosives, bullets, arrows and high caliber sniper rounds coming at them or Toph's ability to raise a 10 ft stone wall? My money is on the bullets and trick arrows. An EMP arrow won't just shut down Cable's gravimetric sheath and expose your whole team to horrible death, it'll put Cable out of commission permanently. 1) It wouldn't matter if they're scattered. Anyone on my team could solo most of your team. Even if it takes a few seconds to regroup, you'll lose at least 3-4 members before anyone on my team goes down. I can't see why I couldn't leave the church, but you can ask Luna. We're not stuck in a dimension where only the church exists. 2) It still won't matter. Show me Toph earth-bending stone at someone and I'll show you every member of my team dodging lasers and superhuman combatants with ease. They're all too fast to just get demolished by some seismic activity. 3) Again, I need her pulling out some bullet-time feats. And it needs to be something comparable to a comic, anime superhuman garbage won't fly. Avatar characters are humans manipulating chi to affect their world, not superhumans like Deathstroke and Adam Jensen. My team will always be too fast for her. I'd like to see scans of Iron Fist vs Hercules and Skaar. Thing and Luke Cage aren't honestly impressive. Temugin smacked around Iron Man and Hulk, who I consider far more impressive. 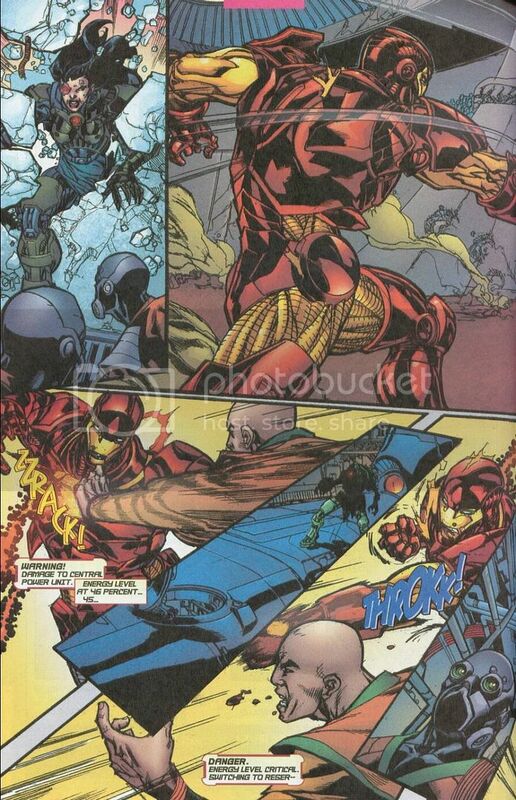 I posted the scans of Temugin vs Iron Man, did you see those? I think I have some of him fighting The Hulk that I can post as well. Danny can't beat any of my guys at once, let alone all. He can hang with some of them, that's about it. The gear sounds fine except the adamantium bullets. Adamantium is a rare metal and I would need direct scans of her using that as part of her regular equipment. People don't just have adamantium bullets laying around. Feel free to post your strategy, please don't make it dependent on my characters drowning in PIS because none of them are stupid and none of them hesitate to kill people as fast as possible. I'll post a strategy... Soon lol. I am otherwise occupied this evening. @Ferro Vida: I think this might have to go to voting soon if you don't have anything more to say dude. I just want to say, all these DV Civil War threads have been great to read, and this one I enjoyed a lot. Thanks for putting so much thought and effort into it. @Lady_Liberty: You're most welcome, I hope it can continue before voting opens on Monday. Due to time constraints on my part, I must respectfully abdicate. Dane is the winner of this battle, and it's a victory that he deserves.